Smaller procedures often involve quick examinations of the patient, but these are generally included as a built-in part of the procedure. However, in certain circumstances, the patient may require a separate and more thorough examination. If modifier 25 is used for a separate examination, this exam must be considered a medical necessity, without which safe execution of the procedure would be impossible. For insurance purposes, this medical necessity may be identified by the phrase "the patient's condition required." Sometimes, an evaluation will take place on its own accord, with no plans of a procedure after the evaluation is complete. If, during the course of the evaluation, the physician determines that a further procedure is required, this should not be considered a modifier 25. In this circumstance, modifier 57 would be more appropriate. Modifier 25 is only used if the procedure has already been scheduled, along with a separate examination. 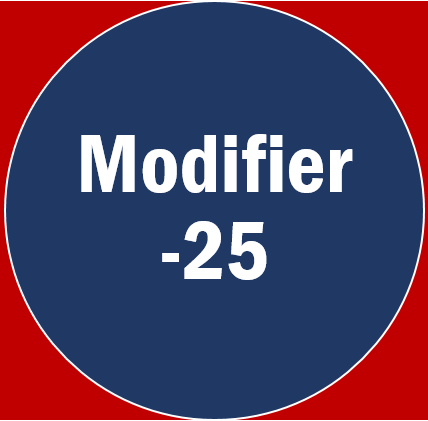 Modifier 25 is generally not used to designate evaluations taking place before routine, regularly scheduled procedures. It is more likely to be used on one-time procedures that are not viewed as part of a medical routine for the patient in question. Visits by the same physician on the same day as a minor surgery or endoscopy are included in the payment for the procedure, unless a significant, separately identifiable service is also performed. For example, a visit on the same day could be properly billed with the 25 modifier in addition to billing for suturing a scalp wound if a full neurological examination was made for a patient with head trauma. Billing for a visit would not be appropriate if the physician only identified the need for sutures and confirmed allergy and immunization status. In the circumstance when the decision to perform a minor procedure is typically done immediately before the service, (e.g., whether or not sutures are needed to close a wound, whether or not to remove a mole or wart, etc.) it is considered a routine preoperative service and a visit or consultation should not be reported in addition to the procedure. When determining whether use of modifier 25 is justified, don't get bogged down by the complex details. You will find your ability to identify circumstances requiring modifier 25 greatly improved if you simply remember that the evaluation and management must be separate -- and that the same physician must be responsible for both evaluation and management. Keep this simple guideline in mind and you are unlikely to incorrectly categorize an evaluation as a modifier 25.